Softdistribution is a growth champion! 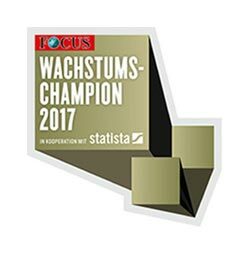 We have just been awarded “Wachstumschampion 2017” by the German news magazine FOCUS in close cooperation with the statistics portal Statista. In competition with over 12500 companies we made it into the top 500 most successful companies in Germany and ranked 22nd in the Information Technology category.